Looking for some inspiration to create a calming ambiance for unwinding? Bringing the ocean’s color palette into your bedroom will achieve just that. Have you ever been to an exotic oceanfront location where the water is the perfect shade of silvery blue surrounded by beautiful green wild grasses, tan sand, cream-colored seashells, and varying shades of gray and brown driftwood? If so, didn’t you just want to bottle up that serene ambiance and take it home with you? While you can’t literally bring the ocean into your home, you can bring the colors, and there’s no better place for them than your bedroom. Your relaxation room doesn’t have to be ocean-themed (i.e., seashells everywhere and pictures of oceans) to implement ocean-inspired colors. In fact, you can implement light blue, seafoam green, cream, tan, and brown without bringing back any souvenirs from the beach. 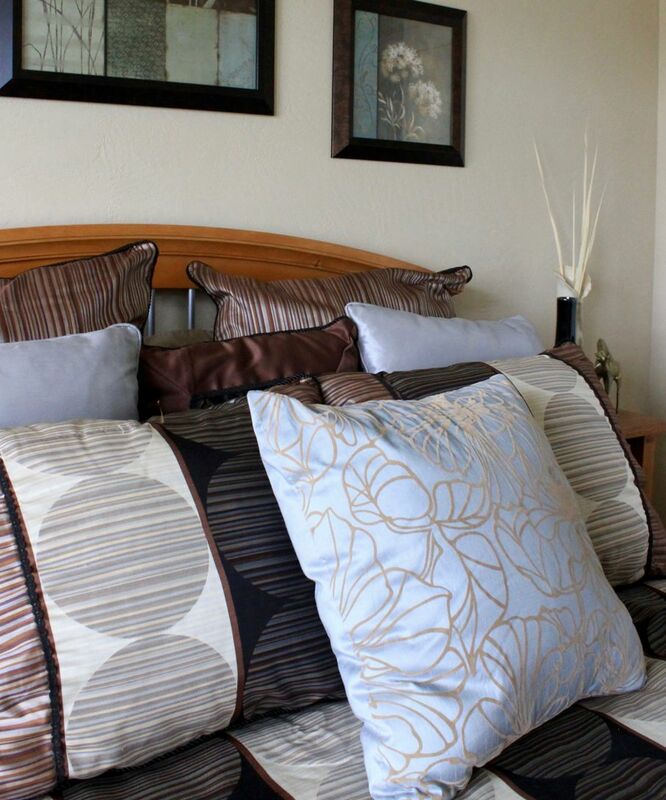 If you want to create a restful, inviting space where you can sleep, read, or just have some quiet time, implement these calming bedroom colors by following these tips. 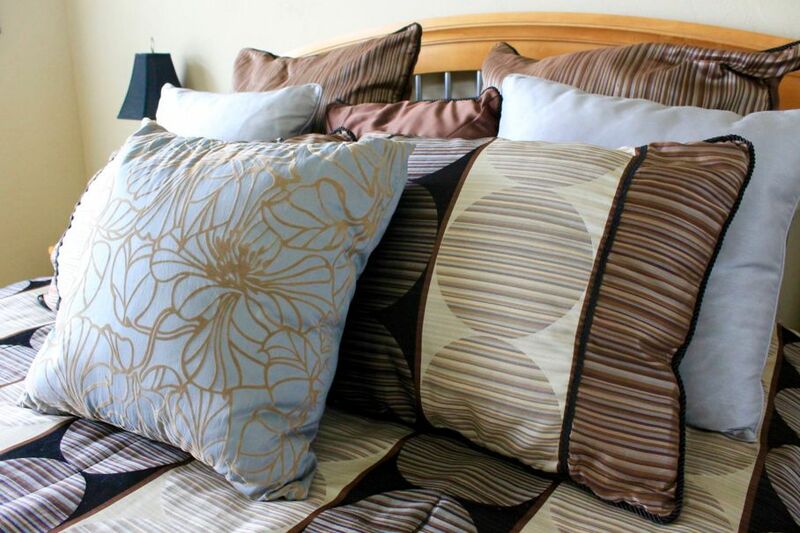 Choosing furniture and a comforter with the two “earthiest” colors (i.e., warm tans and rich browns) leaves room to add accents with the brighter colors (blue, green, and cream) in the form of throw pillows, candles, paintings, and vases. The rich, silky brown comforter has the perfect amount of lighter accent colors to keep the room from looking too dark and monotone. 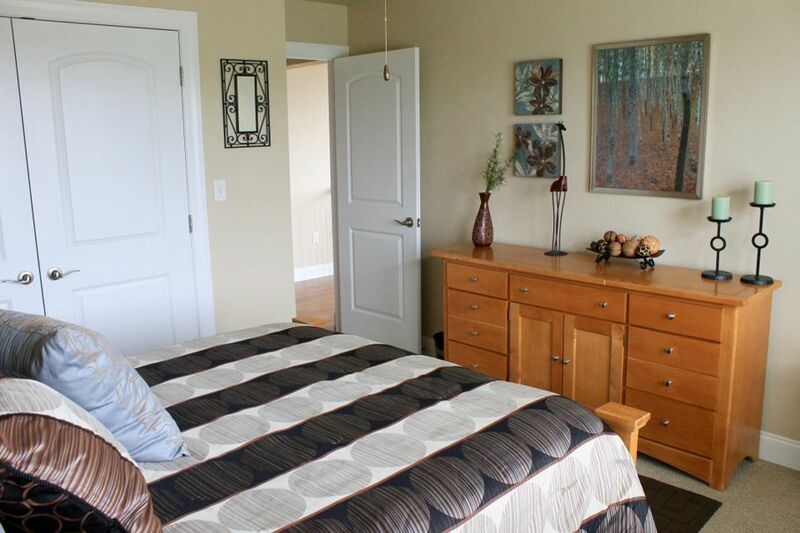 It also perfectly complements the tan bedframe and dresser and balances the brown shade scale. 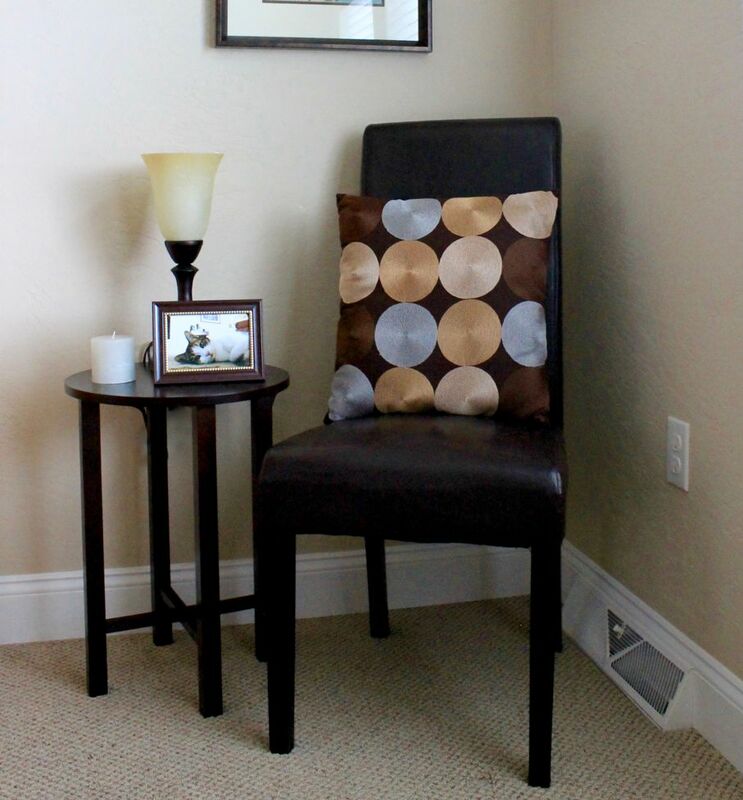 Another example is this dark brown chair. By contrasting with the beige wall, the chair creates a stunning focal point in what would be an otherwise bare corner of the room. The throw pillow adds visual interest with a fun pattern and brighter colors from the ocean-inspired color palette. Creating a light-and-dark contrast with every piece of décor really brings each area of the room to life. 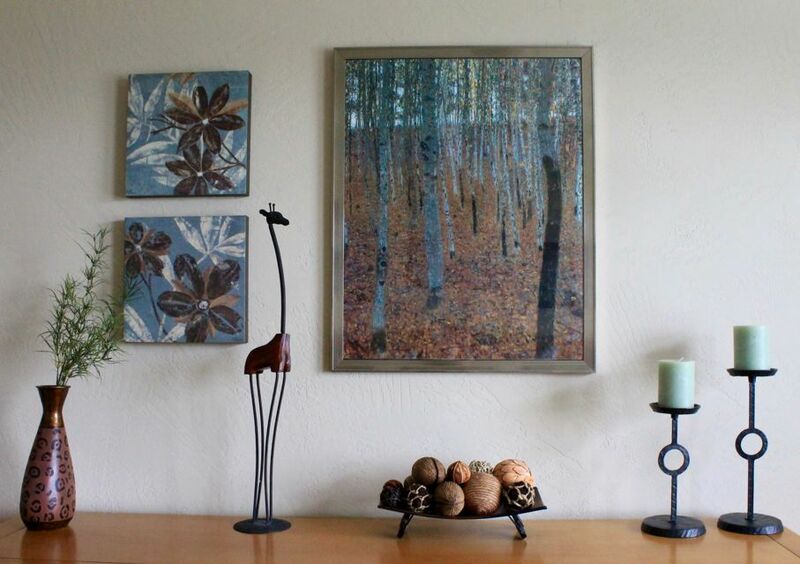 Implementing various shades of natural greens brings an extra layer of color and dimension to the room. 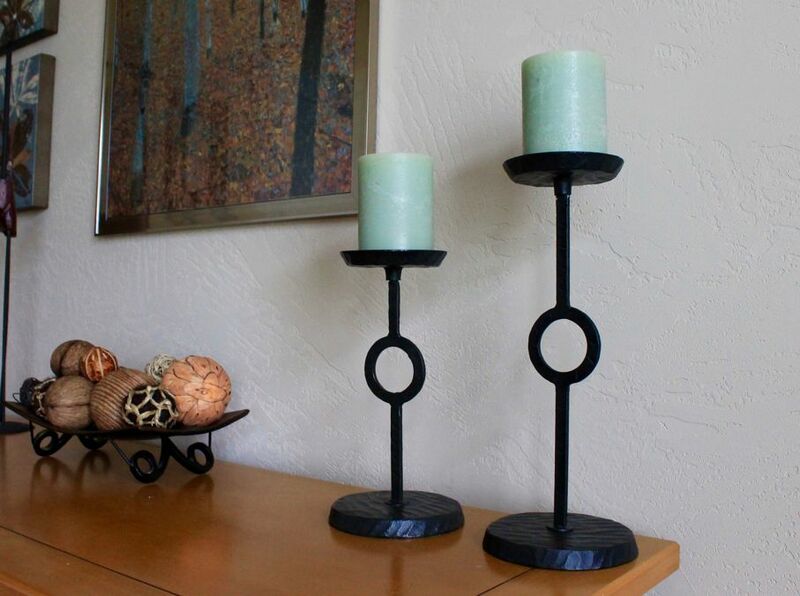 These seafoam green candles are the perfect ocean-inspired shade, and again, create that light-and-dark contrast against the dark candle holders. 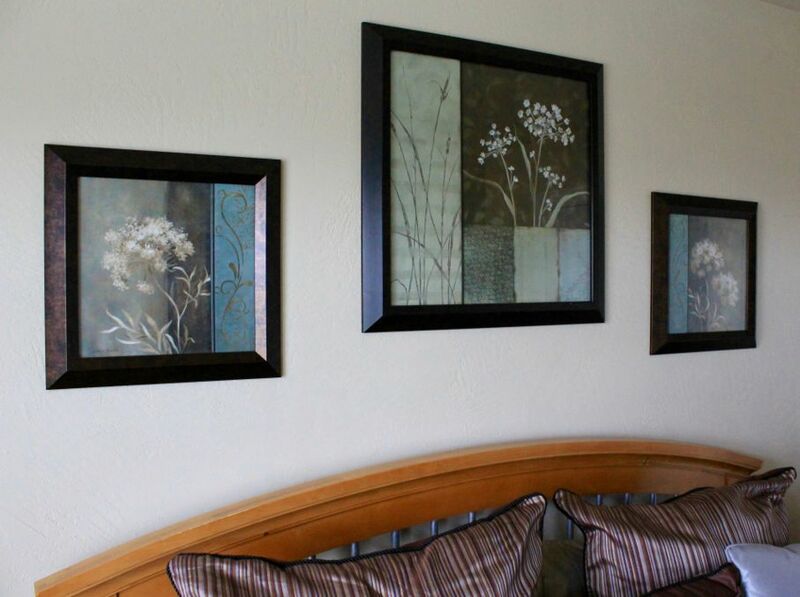 The paintings above the corner chair, as well as the paintings above the bed, provide soft, grassy colors to complement the blues and make the tans and browns pop. Silk plants and even vases with grasses and reeds can add another subtle element of green to brighten up your serene bedroom even further. Adding subtle touches of the lightest color in the palette provides an elegant touch to the light-and-dark contrast theme. 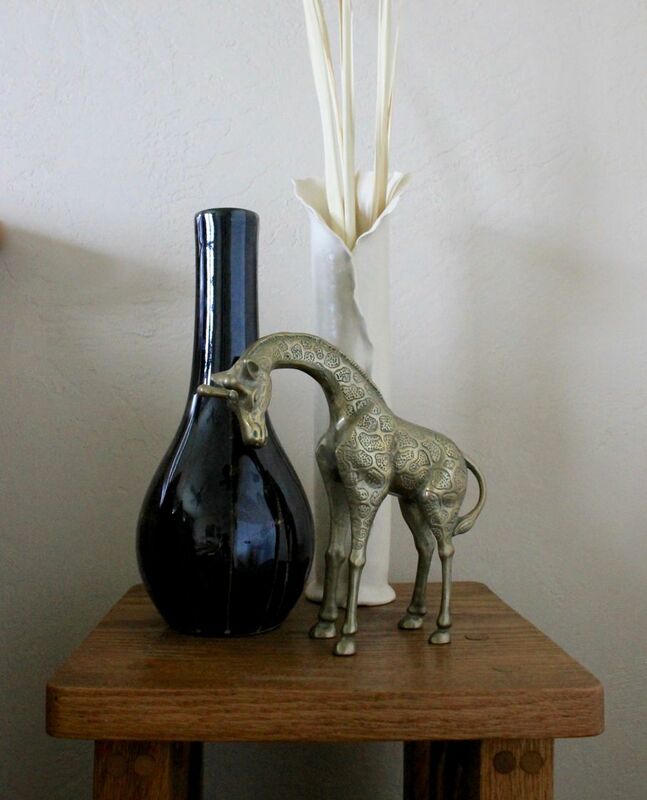 This tall, slender cream vase with cream-colored reeds look stunning against the black and bronze. The varying silhouettes (and the light, medium, and dark hues in each) creates a statement all on its own. 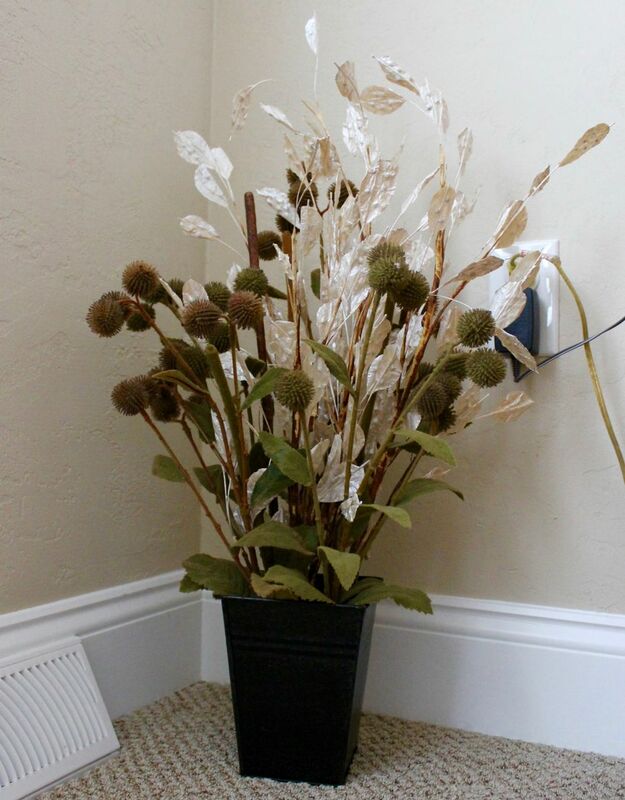 This floor vase also implements grasses and reeds, and the cream colors stand out at the top to soften and contrast the green and dark brown tones. The mixtures of shape, color, size, and height accomplish double duty as they help to camouflage the cords from the nightstand lamp. When creating relaxing bedroom colors, light grays and various blue shades, ranging from silvery blue to teal, are the colors that will bring those calming ocean vibes to the forefront. The throw pillows with the circular design display subtle shades of light and the blue throw pillows provide a slight metallic hue, which the darker turquoise colors in the pictures below. That muted blue can also be seen in the paintings above the dresser, where they are part of the entire color palette as they’re among the browns, tans, creams, and greens in the rest of the painting. The décor on the dresser below also helps to bring the entire calming bedroom color scheme to its highest peak, as this wall becomes an amazing focal point. Implementing these calming bedroom colors will help you rest and relax, and just might be the next best thing to an oceanfront view (but of course, take the day at the beach if you have the choice).